Property Size 1,479 sq. ft. Enjoy this beautiful newly remodeled 3 bedroom, 3 bath cottage. The master bedroom has a king size bed, walk in closet, and large private bath. Large vaulted ceilings and a spiral staircase leading to the loft highlight the spacious living area. The second bedroom has a queen bed and its own bathroom. Upstairs, you will find a loft that overlooks the living area and also has two full beds and also has its own bathroom. Spend mornings and evenings enjoying the beautiful Florida weather on the screened in porch. This resort has something for everyone in the family. Whether they love the beach, tennis, or walking trails, there something here for them. 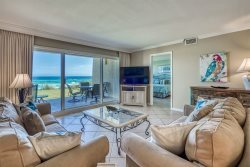 The beach is a short walk down the manicured walking trail or a short ride on the complimentary shuttle. Add $125.00 for housekeeping and 12% for tax. There is a $69 booking fee; 2.5% fee to process credit card payments. A deposit of 25% of the rate holds the unit for you and is applied toward the rental fee.